Don’t get us wrong—we love bib tights. But when the temperatures reach a point where total coverage is required, we understand that your cold weather protection becomes a matter of preference. Our Therminal™ 2.0 Leg Warmers exceed the demands of those who embrace leg warmers, with a warm, articulated construction that interfaces gracefully with your favorite pair of bib shorts. They have a construction that’s comprised of our Therminal™ fabric, which is designed to both insulate and manage moisture buildup. To do so, it has a brushed fleece interior with a light loft that pulls moisture away from the skin to evaporate it at the material’s surface. This loft also has the added benefit of insulation, which occurs by trapping tiny pockets of warmth between the skin and the fabric. At the exterior, you’ll find light levels of wind and water protection that’ll have you riding comfortably through mixed conditions. 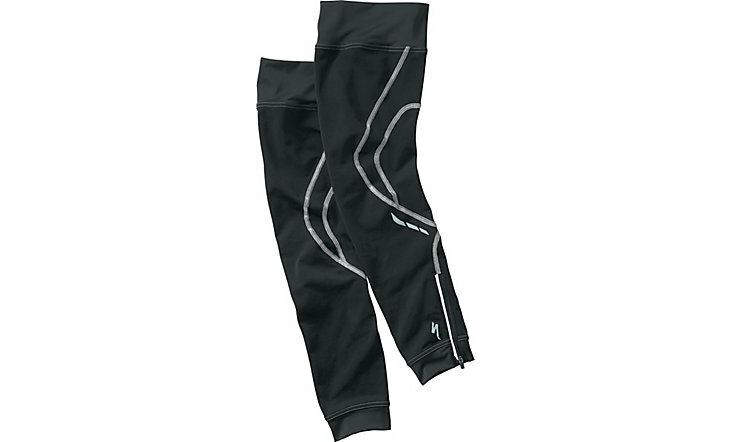 As for fit, the warmers have an articulated design that conforms to the leg and its various positions and movements while cycling. And to ensure that they stay set where you want them, we’ve included a light silicone print to gently hold them in place.